There is no such thing as “healthy dessert”. Dessert is indulgence, a treat, not health food. That said, so many times I have come across dessert recipes that are cloyingly sweet and/or too greasy. Excessive sugar and fat overwhelm overall flavor and add to the calorie count. I have found that often a recipe follows some superficial rules that get replicated out of tradition, without any substantiation. I question things, including recipes. I want to know the “why”s behind every ingredient. And if loads of fat and sugar are crucial to achieve the best result, I will follow the recipe. Otherwise, I will adapt it. 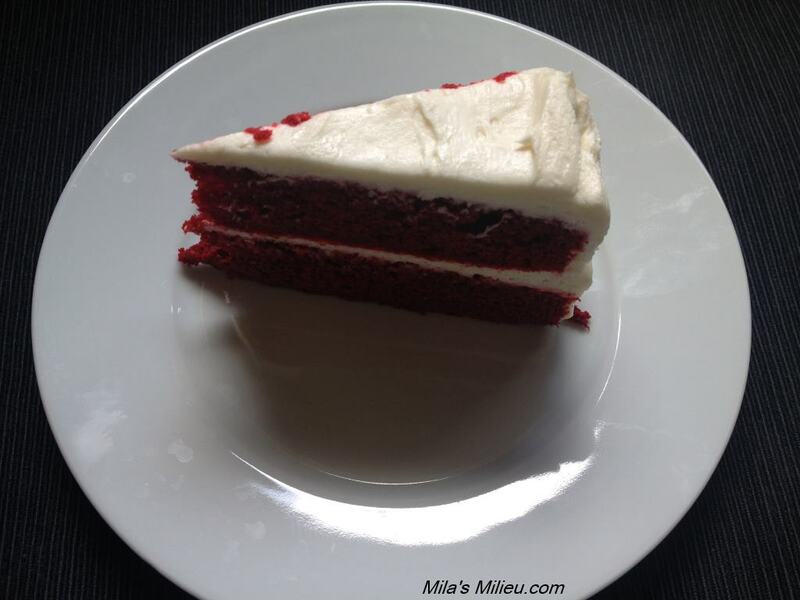 This recipe for Red Velvet cake is delicious–moist and flavorful with a hint of chocolate as a good Red Velvet cake should be. I cut the amount of sugar in the cake, and both sugar and fat in the icing, with no harm to the texture or flavor of the cake whatsoever. In fact, I believe it improved the original recipe. (Adapted. I can’t find the source anymore. If you recognize this as your recipe, please let me know). 1. Preheat oven to 350 degrees F. Grease and flour two 8-inch or 9-inch cake pans (I like to use PAM with flour in it). 2. In a large bowl cream butter and sugar till light and fluffy. Add eggs one at a time. 3. Combine yogurt (or buttermilk) with the food coloring and vanilla extract in a small bowl. 4. Combine flour, cocoa powder, salt, baking powder and baking soda in another bowl (make sure there are no lumps in your cocoa powder. Sifting helps with that). 5. Alternate adding yogurt mixture and flour mixture to the creamed butter in the large bowl. Mix just until combined– do not over mix! 6. Pour into the prepared pans and bake for 30-35 minutes until a toothpick inserted in the center of the cake comes out clean. 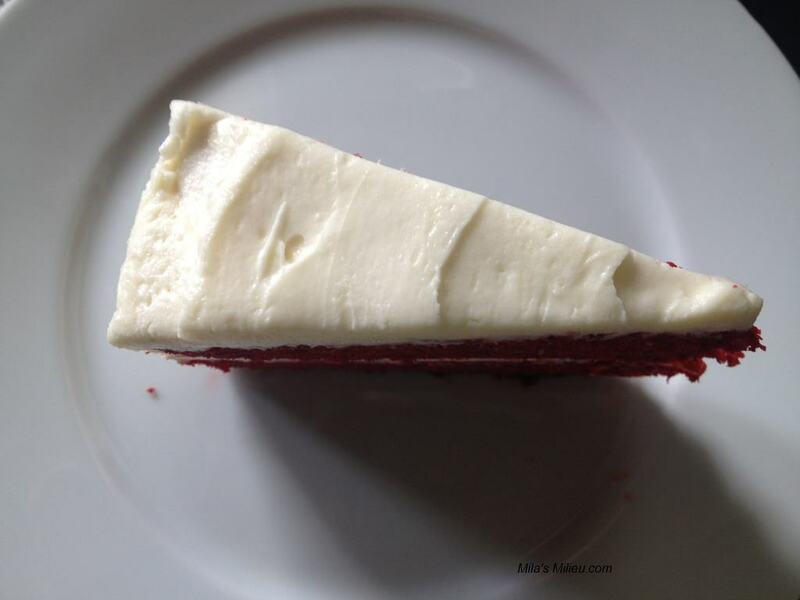 Make sure to start checking early: over baked Red Velvet cake becomes dry. Cool for a few minutes in the pans, then remove to a cooling rack and let cool completely before frosting it. 2 1/4– 21/2 cup powdered sugar. Beat the Neufchâtel cheese with butter until well blended. Add vanilla and powdered sugar, blend well on low speed, then whip up the frosting on a higher speed till light and fluffy. Cover the top of the 1st layer with frosting and put the 2nd layer on top. Cover the top and sides of the second layer with a thin layer of frosting. Don’t worry about crumbs showing: you are making a crumb layer of frosting at this point. Chill the cake for at least 30 min. Then cover the top and the sides with the remaining frosting. Chill until ready to eat. To serve, let the cake sit at room temperature for about 15 minutes. 3 eggs! Thanks for catching that, Gina. I updated the recipe. Red velvet is one of my favorites! It’s great to have a healthier version to try! Yes, Amy, I love RV as well and make it a couple times a year– one for my daughter’s birthday, and one for Valentine’s. If only copious amounts of food coloring were “healthy”, I would make it more often! Oh yum! 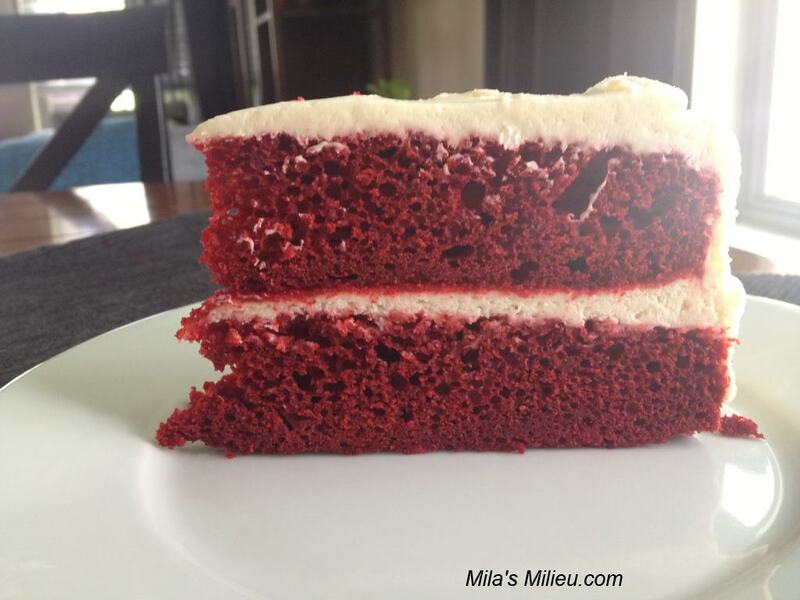 I’ve never attempted to make a red velvet cake, and this looks easy enough. Thanks for sharing!